Good bathroom design, starts with the basics. Here are twelve pro tips to consider in your remodel or renovation. The fun part of bathroom remodeling is ogling vessel sinks, walk-in showers, towel heaters, translucent tiles and graceful faucets. Even the newer toilets on the market are pretty cool. But when it comes to putting together bathroom designs in plans that you (and your building inspector) will be happy with, there are some recommendations and rules you should follow. Here is a selection of a dozen, courtesy of the National Kitchen and Bath Association (NKBA). It’s smart to design for all eventualities. According to the Americans with Disabilities Act, a bathroom door opening should be at least 32″ wide when measured from the open door to the opposite stop. That means the door itself should be at least 34″ wide—unless you’ve opted for a pocket door. It’s not a good idea to slam the bathroom door into a loved one. Make careful measurements so that doors won’t bump anyone standing inside the bathroom. Similarly, no door (entry, cabinet, or shower) should bump into any other door. In a very small bath, change the hinges so the door swings out. Bathrooms must often be shoehorned into tight spaces where ceiling height is less than the general code calls for. For bathrooms, the minimum height is 80″, except in places where occupants can’t walk. In these cases, the ceiling can be even lower. Talk to your building department about what they will or won’t permit. A little extra space goes a long way in the bathroom, especially when two people must use it at the same time. NKBA designers recommend a 30″ clearance between the front edge of a fixture, such as a vanity or toilet, and any other fixture or wall. The building code allows for a minimum of 21″. 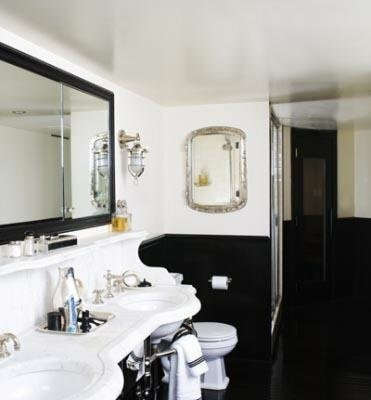 The bathroom lavatory, or sink, should be placed far enough from a wall or shower wall that it’s comfortable to use and easy to clean. The NKBA recommends 20″ measuring from the center of the lavatory to the wall. Code is a minimum of 15″ (with 4″from the edge of a pedestal sink to the wall). In a double-sink vanity, the sinks should be 30″ to 36″ apart, measured from center to center. A comfortable height for a lavatory depends upon the height of the user, but when two or more people of varying heights are using the same sink, you’ll have to compromise. A 36″ height is standard. The NKBA says the height can range from 32″ to 43″. What you choose is up to you, but it’s probably not a good idea to install a low vanity for small kids. They grow up quickly and can use a stool in the meanwhile. A single light in the ceiling of a bathroom will put shadows under your eyes, even when they don’t exist! Add lighting above and to either side of the vanity mirror. Called cross lighting, it will eliminate shadows and provide enough light for grooming. You may consider a recessed light with a waterproof lens over the tub or shower, as well. Avoid sharp corners on countertops for safety. Top edges should be rounded over. Corners should be rounded too, or “clipped”. For user comfort, a 36″ x 36″ space is recommended. Codes will allow a minimum 30″ x 30″ stall. A shower with an angled door should be at least 32″ x 32″. The height of shower controls should be 38″ to 48″ from the floor, depending upon the height of the user. Tub controls should be between the rim of the tub and no higher than 33″ from the floor. This, of course, poses a problem if your tub and shower are controlled by the same lever or knob. In such cases, this author’s opinion is to keep the controls below 33″. In an emergency, it can be quickly reached by someone sitting in the tub. A toilet should have some elbow room between it and another fixture or vanity. The NKBA’s recommendation is at least 18″. Codes allow a minimum distance of 15″. If you’re placing your toilet in a compartment, it should be 36″ x 66″, although codes will allow 30″ x 60″. Even the toilet paper holder merits a recommendation. The NKBA says to put it 8″ to 12″ away from the front edge of the toilet bowl. It should be 26″ above the floor. For more excellent information about bathroom design, visit the NKBA.